ABOVE: Chair and ottoman from Mbanci Furniture and Fineries, rug by Paco Rugs and wallpaper from Black Fabrics. Sendai bookshelf by Horm. Tom Dixon Mirrorball and stand, both M Square Lifestyle Necessities 011-447-0807. Vases, Front Door Interiors 013-751-2896. Side tables, Effem Hall. All pink hair and vivaciousness, Luella Olley is as bold and colourful as the home she has just built. A manifestation of bi-continental influence, the structure references the tin mines that formed the landscape of her childhood in Cornwall and the vast expanses of the central and southern African metal processing plants that Luella and her husband, Dean, have spent the greater part of their professional life working on. ABOVE LEFT: In the centre of the Olley’s home, a brick chimney and suspended concrete staircase establishes an unexpected, sculptural feature. Contemporary paintings by Richard Scott available from the TheCarlSmythCollection 073-915-8897. Stainless-steel balustrade by Kraftworx 082-575-2878; MIDDLE: Emu Retrouve planter used as towel holder, A+I Unlimited Design. 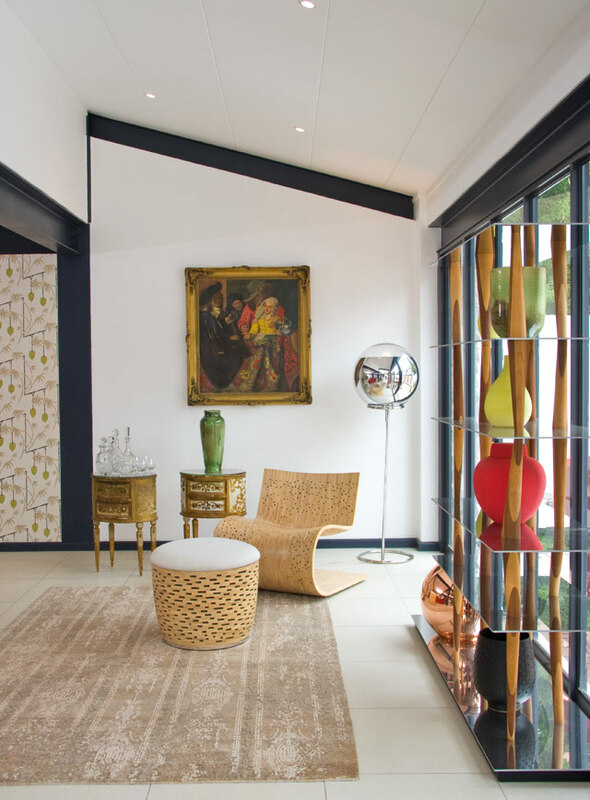 Artwork by Richard Scott; RIGHT: The industrial nature of the open-plan interior is relieved by sharp colour accents and an eclectic collection of furnishings. Antique carved chairs from Mbanci Furniture and Fineries and Nguni Skin from Ariel Design Studio, 078-450-9616. Architect Christoff Wipplinger, whose creative expression (like that of the Olleys) leans towards the element of quirk and surprise, conceived the design on the basis of a Free State farm barn structure. Where the exposed steel I-beam framework supporting the double-pitch corrugated roof and lower lean-to clearly entrenches the intended industrial integrity, Christoff’s desire to imbue the building with a personalised energy is perhaps not as obvious. 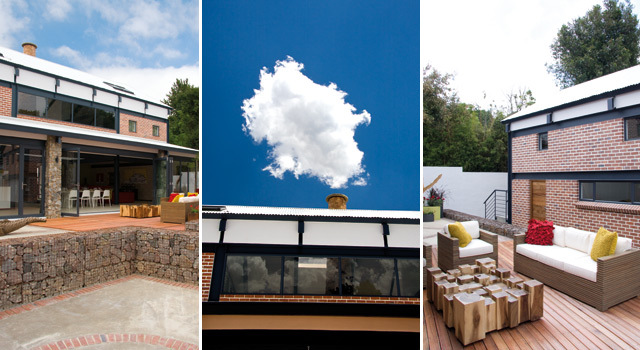 ABOVE LEFT: Architect Christoff Wipplinger’s Free State barn-inspired structure features a typical corrugated iron lean-to but is given industrial edge with an exposed I-beam framework, gabion walls and red facebrick; MIDDLE: The chimney ascends the vertical height of the home, emerging beyond the roof through a skylight by Fabtec Skylite 083-260-8116;RIGHT: Outdoor furniture, Black Fabrics. Table, Mbanci Furniture and Fineries. A narrow wedge of wall appears to dislodge from the exterior and, inside, the rigid rectangular plan is deftly activated by a series of angled and cantilevered elements. Without a doubt the hero of the space is the towering Cornish brick chimney which partners with the circular staircase to balance in rounded form. Realising that the best bit of this vertical projection would lie beyond the roof, a glass skylight was installed to reveal its full vertiginous effect. Colour has been warmly embraced and contributes to the energising high. It was, in fact, a tin of bright red paint that inspired the treatment of the interior. Leftover from a previous project, Dean suggested painting the cantilever feature wall of the main bedroom with it. This plane of saturated colour combined with the red kitchen cabinetry, white walls and dark-grey steel beams recalled the works of Mondrian. 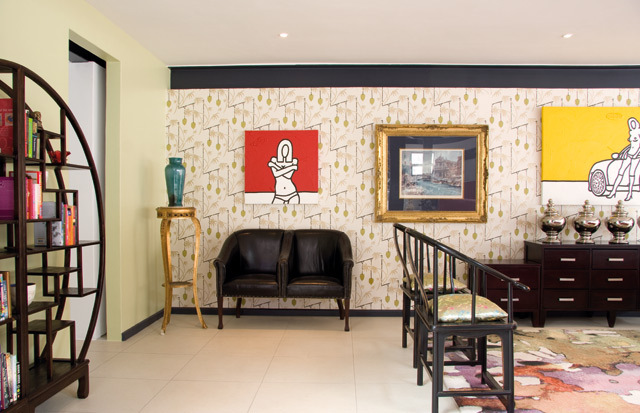 The idea went on to be expounded throughout the interior with further flashes of primary from paintings by Cape Town-based artist Richard Scott. It is really the bathrooms, very often the glossed over ‘extras’ in a domestic production, that steal the show – and it is in their simplicity and boldness of colour that they do. In one a turquoise wall of mosaic makes for a Turkish bath delight and the candy stripe barcode in the other would see you wanting to spend more time in these rooms than anywhere else. The kitchen, floating on a mass of ethereal blue, is a source of professional pride for Luella and Dean. Evidently their employees at Afrores & Trinidad – a manufacturer and installer of industrial acid-resistant linings – were so inspired by the project that some decided to get involved. 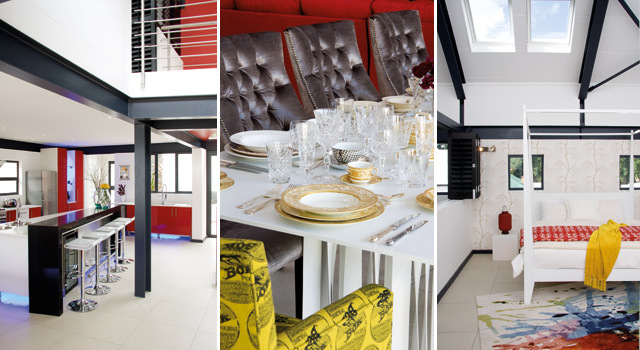 Installation manager Morne Frampton and assistant Brent Geldenhuys built a budget kitchen but with all the trappings of modern-day gadgetry by independently designing it and sourcing fittings at cost. 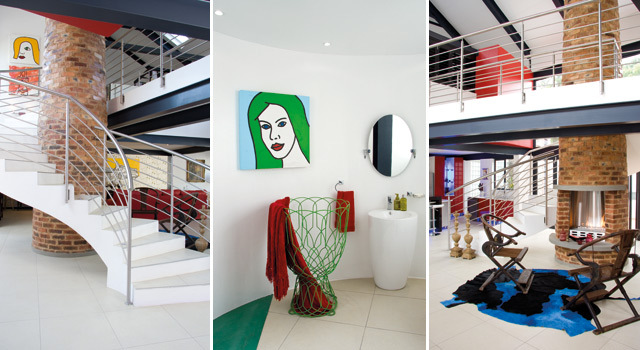 Not to be outdone by her colleagues, personal assistant Nadine Botha spent a fortnight scouring the furniture showrooms of Johannesburg with Christoff and interior decorator Mariette Venter. ABOVE LEFT: The kitchen was designed and all items – from cabinetry to fittings – were sourced by two of the Olleys’ industrious employees; MIDDLE: Deep-buttoned dining chairs X-treme Décor. Table laid with crockery, cutlery and glassware from Effem Hall; RIGHT: Four-poster bed and side table, Coral Tree Furniture. Rug from Paco Rugs. ‘As the Olleys are not the kind of people to stick to one style,’ reveals their on-the-ball right-hand, ‘we aimed to assemble an arresting collection of furnishings that would have the potential to evolve with future additions.’ And the interior is exactly that: a casually formulated space that sees hand-carved African chairs and an electric-blue-dyed Nguni skin share space with oriental antiques and contemporary showstoppers. A spirited ensemble where a Louis XVI period piece wouldn’t at all seem out of place, it is the animated exterior of this merry suburban barn that provides the perfect prelude to exuberance that lies within. 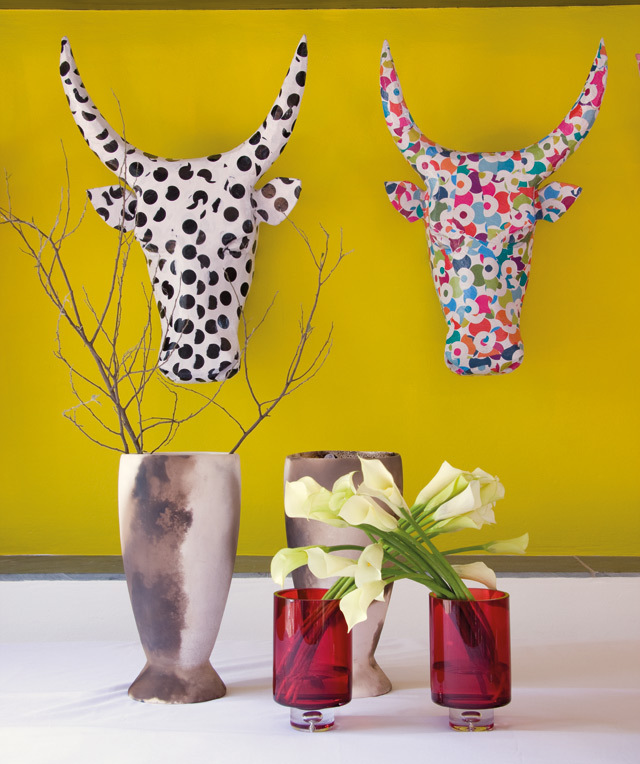 ABOVE: Nguni heads from Ariel Design Studio 078-450-9616.